Symbolic computing with multivariate polynomials in R.
Whether you’re working with a single multivariate polynomial or a vector of them (mpolyList), if it/they are actually univariate polynomial(s), the resulting function is vectorized. 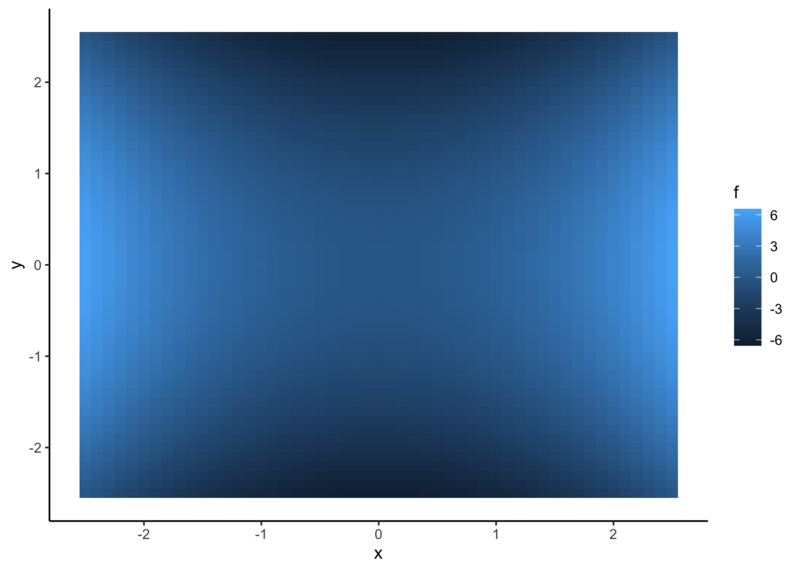 Here’s an example with a single univariate polynomial. mpoly can make use of many pieces of the polynom and orthopolynom packages with as.mpoly() methods. In particular, many special polynomials are available. This material is based upon work partially supported by the National Science Foundation under Grant No. 1622449. Packages are now imported more nicely (@importFrom in all cases). mp() is now based on R's parser and mpoly arithmetic. The performance boost varies with things like how many parenthetical expressions are used, but in basic cases ranged from one to a few orders of magnitude. More importantly, many hard to catch tokenizing problems should be gone. A bug in mpoly/numeric arithmetic. Fixed by @Blaza (thanks!) and tests added. Add is.unipoly(), a predicate for univariate polynomials. Add solve_unipoly(), a mpoly wrapper for polyroot(). plug() now works on mpolyLists. as.function.mpoly() and as.function.mpolyList() no longer message when the resulting function arguments are clear. as.mpoly() methods for lm objects using poly(, raw = TRUE) statements now works properly. the print.mpoly and print.mpolyList methods now print with cat() instead of message(). they also accept a silent argument, in which case the output is suppressed; characters are returned silently. the argument order has changed so that stars follows varorder and order. a stray browser() statement was removed from as.mpoly(). you can now pass * for multiplication in mp, so that mp("x*x") works properly. all java stuff has been removed; see the m2r package for grobner basis computations. mpoly now provided functions for extracting the leading term (LT), leading coefficient (LC), leading monomial (LM), and arbitrary term (as in p). You can also compute the multidegree of a polynomial (multideg). new function exponents extracts the exponents of an mpoly. new functions homogenize, dehomogenize, homogeneous_components extract those components of a multivariate polynomial. as.function() now returns vectorized functions when the polynomial(s) are only of one variable. terms.mpoly is now deprecated, use monomials. reorder.mpoly now defaults to the lex order. Versioned directly modulo very minor CRAN changes from 0.1.1 for CRAN consistency. A new function called plug allows users to plug values into indeterminates in mpoly objects. mpoly now imports the polynom and orthopolynom packages, and has as.mpoly methods to parse their objects into mpoly objects. mpoly now imports reshape2 for some visualization stuff. A new function called chebyshev allows users to compute Chebyshev polynomials. This is based on orthopolynom. New functions called bernstein and bernsteinApprox allow users to compute Bernstein polynomials and approximate functions with Bernstein polynomials, see examples. A special as.function method exists for evaluating these in a numerically stable way. A new function called bezier allows users to compute the polynomials associated with Bezier curves. A special as.function method exists for evaluating these in a numerically stable way via de Casteljau's algorithm, based on a new function called bezierFunction (exported). Several new predicate functions are exported. The internals of tuples have been changed, but the user shouldn't expect to see them. A bug in mp functions where non-parenthetical exponents in parenthetical expressions were mis-parsed has been fixed. round.mpoly now drops terms rounded to have 0 coefficients. round now has a method applicable to mpoly objects that rounds the coefficients. this is particularly nice in combination with as.mpoly.lm. Vastly enhanced mp parser based on stringr 9.0.0 (now dependent on stringi). Description file updated for CRAN's standards. Parenthetical expressions are now handled. Permutations now returns a better ordered listing of the permutations of a set. It also allows for the more flexible specification of (e.g.) permutations(5) for permutations(1:5). Some negative parsing in mp has been fixed. Division symbols in mp now return an error. mpoly now has a GPL-2 license. Fixed a glitch in print.mpoly that made mp("-1 + y") print as "-1 1 + y". mpolyList now works on single elements, either a mpoly object (converting it to a mpolyList) or a call to mp. mp now properly handles constants raised to powers. Fixed an issue with as.mpoly (and is.mpoly.lm). as.mpoly method now defined for lm objects which makes an mpoly object out of a linear model.